With my limited experience of trying sausages/chorizo from different countries, I can say in all honesty I haven’t found anything close to a Goan sausage. Maybe the Mexican El Pastor Recipe could have some resemblance. This mouth-watering pork sausage that is sun-dried, smoked and spiced with garlic, ginger, red chillies, spices and vinegar is definitely out of this world. When a Goan catholic leaves home that is one sure food they will always miss. This intense flavored sausage can be used to make many recipes including Sausage Chilli Fry, Chouriço Pao, chouriço Pulao, Feijoada and Sausage and Potato Curry. I remember my mom making it during her summer holidays and storing it in a ceramic airtight jar for months. She would be particular that only she would take out the meat from the jar. One thing I do remember my mother’s preserves would last a real long time because she took so much care and was extremely clean in handling them. This recipe requires time, patience and being careful. 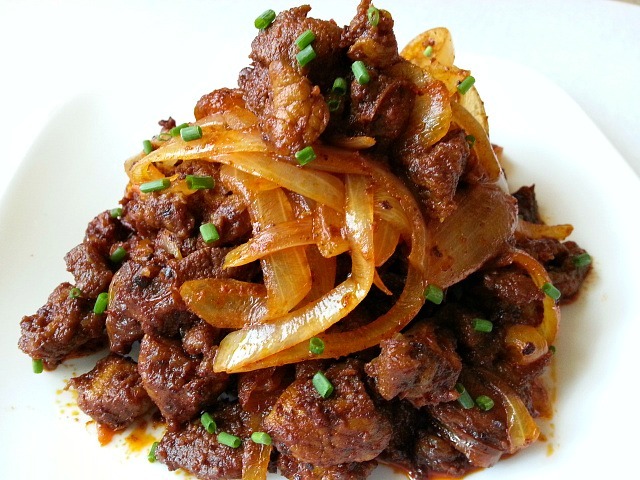 To make the Goan sausages, pork is a meat of choice but you can use beef or chicken. Back in Goa “Salt Petre” also know as “Potassium Nitrate” is used as a meat preserve. I have skipped using Salt Petre after reading about its different uses in US and am not comfortable using it in foods. Wash the cut meat and dry it well with a paper towel. Apply salt, vinegar and put weight on the meat. Check every couple of hours and drain the water out. Let the meat stand for at-least 24 hours. Drain out any more liquid that is released. 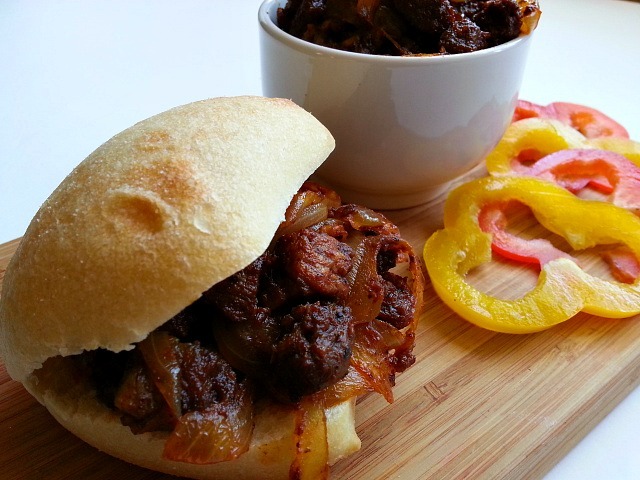 Wipe the meat again with dry paper towel. Apply the sausage masala paste, crushed garlic, sugar and keep in the sun covered with a mess. Stir the meat couple every couple of hours. Drain out any liquid. Repeat for 1 or 2 days. The meat will look dry. Transfer to a glass jar with a glass lid or plastic. Avoid any metal lids as they will rust due to vinegar. Store in a cool dry place for couple of months. Use only dry wooden or plastic spoon. You can stuff the meat in natural casing and dry it again in the sun for a day and smoke it under indirect fire wood heat. In a hot skillet add the chopped onion and sausage meat and saute on medium heat for 10-15 minutes till the meat is cooked and the onions soften. Stuff in a hot-dog roll for Sausage Roll or in a Pao for Chouriço Pao. This spicy sausage goes really well with chilled beer. Chouriço Pao is a very popular street food in Goa and also for feasts celebrated by Catholics, it is a great snack food to sell to raise funds for various church groups. I want to send along a thank you for your like of my “Unless You’re a New Englander” write-up. I’m so enjoying the sunny, dry and COOLER weather! Great recipe with simple ingredients. This looks wonderful. 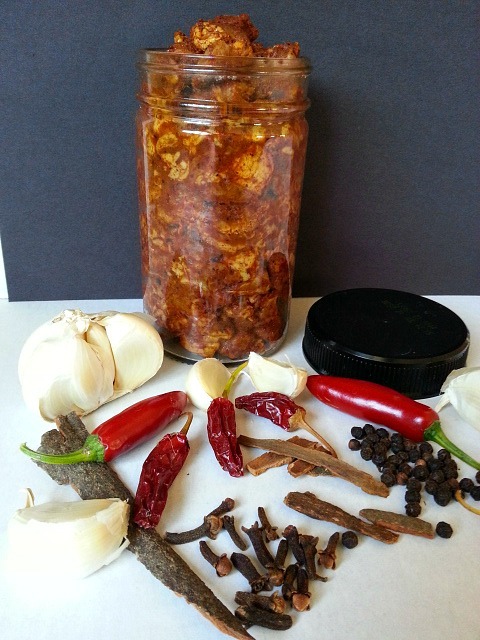 I have made Spanish chorizo, and the recipe is similar – who knows what the “secret spices ” are. “Pink salt” i.e. salt peter etc. is an ingredient. I understand your concern. Thank You Darryl, I think they use pink salt and red food color in Goa to give the sausages a real deep red color. That is so nice Jackie…9/11 is a very sad day and I still remember getting a call from my brother in law from UK to let us know about it at 6 am in the morning. May have to try this, but without sugar. Looks yummy. Thank you for the like of my Peach Festival story – much appreciated. I see your recipes are as popular as ever and that is quite understandable! . I want to thank you for the like of my “Botticello Farms” write-up. Hope you enjoyed the summer. This does sound amazing. I’ll have to go on a hunt for the ingredients but it sounds like it’s worth it. Thanks for sharing and thank you for liking my blog. Beautiful Nandini is so cool with her awesome spicy Goan foods! Thanks for all the likes! Can u please send this recipe to me by Email. Thank you. Sure, let me know your email address. Thanks! Really enticing pics! And thanks for liking my post about Irena’s cookbook – I would love it if you could share with your friends! It’s a good book – and she’s nearly broke, due to financial elder abuse by her son. Goa seems like an awesome place! Wow! After reading your posts, I am humbled that you liked my “Easiest Fruit Salad Ever.” Great looking food! Have you tried pink salt (pink curing salt) instead of saltpeter? This looks so delicious! I really want to try making it myself but, in the meantime, I think my readers might enjoy trying it so I’m re-blogging it! I seriously doubt whether this will even make it into a jar in the fridge…just give me a fork!!! This sounds positively, mouth-wateringly delicious! Thanks for the recipes…they’re all winners! Great blog! That does look nice. I really enjoy a good sausage. My wife Gloria is not the biggest sausage fan. More for me! Thank you for stopping by our blog, HeyGlrlfriend.net Your recipes look amazing and I can’t wait to experiment! Wow! Pinned. Thank you, can’t wait to try this! Thanks Nandini for the “Tavern Trot for Alex’s Lemonade Stand” like. It’s such a worthy cause. I haven’t tried them yet, but I loved the pics. I’m gonna try that! Thanks for sharing! 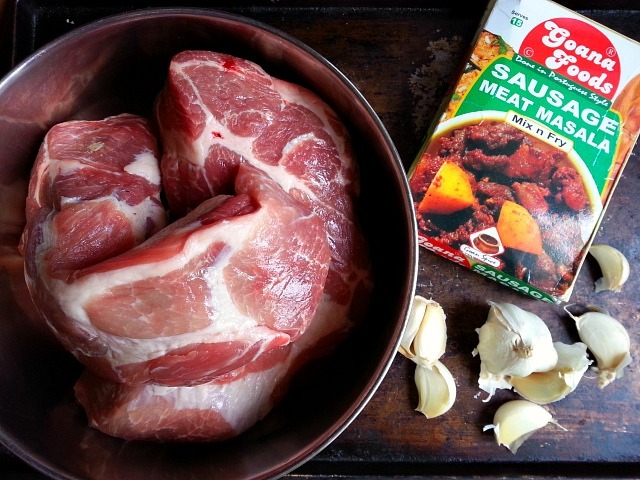 Kinda reminds me of good chorizo, which can vary quite a bit down south – that said, I am so gonna make this! Knowing that southern foods have a spicy kick then the rest parts of US I am sure there maybe be something similar. So interesting! We have so many many kinds of chorizos in Spain, both fresh & cured, according to city and region. One that I am dying to try is “green chorizo” of the 1* Michelin Mexican restaurant Punto MX in Madrid & now the Goan one too! That is so awesome 🙂 There sure are many varieties of chorizos and some have very distinct flavors. The Green Chorizo sounds quite exotic. I have still not found out what’s behind it, but have it from confirmed source that it is amazing. Hopefully some day I will get to visit Spain :-). Have a great weekend. Hello Nandini, I like your sausage meat recipes. The rice dish looks a treat, and the hot dog one too! The only sun-dried meat I’ve ever eaten – or heard of – is jerky. I always learn something by reading your posts. Thanks. Oh wow FAB Nandini. Love Goa Sausages, how did it turn out without the addition of the Goa vinegar? Or do you have some? I was also intrigued by the masala, is that a new paste that you sell? I’ll have to advertise your site on my FB, I’m sure all the Goan lovers will love your recipe :). Gosh, I’m salivating now, would love that pulao with the Goa sausage. I love sausages and this one looks great. I have never heard of packing raw meat in jars in this way but I’m definitely tempted! Thanks for sharing. Thank You Much Amanda. As the meat is pickled and dried in the sun it does not go bad but is preserved. Handling it has to always be with well dried utensils. This was my 3rd attempt in making this recipe as the meat went bad the first 2 times since I had not drained the liquids well and was not stirring it as quite often. Guess these methods were used way back before refrigeration.. Thank You so much for the Re-blog. OOH LA LA! GOAN SAUSAGES are definitely DIVINE, without a SHADOW OF A DOUBT. There is no other way to describe them. I tried many different SAUSAGES/CHOURICOS from various parts of the globe. Nothing to BEAT OUR GORGEOUS GOAN CHOURICO. I LOVE GOAN CHOURICO TO BITS. When in Goa, I always make it a point to treat Myself to the MOUTH WATERING CHOURICO PAO. I think it is a DELICACY, not to be MISSED. Unfortunately, these days the sausages You find in the Margao,market are not as good as they used to be in the seventies. When My spouse goes to Goa, She returns with a suitcase full of GOAN SAUSAGES. BLIMEY! If She ever gets stopped by customs, I bet they will put a stamp in Her British passport and probably fine Her and confiscate the sausages. I know Australia is very strict about what people import into the country. I don’t know how it is like in Canada/USA? Her in the U.K they are a bit relaxed about what people bring into the country.But a few yrs back, the customs became nosey about what people brought across the border. A lot of Goan’s got fined for getting in Goan foods and a red stamp in their passports.I suppose the objective of the excercise was to make sure. people were not bringing foods in the country which did not meet BRITISH STANDARDS. 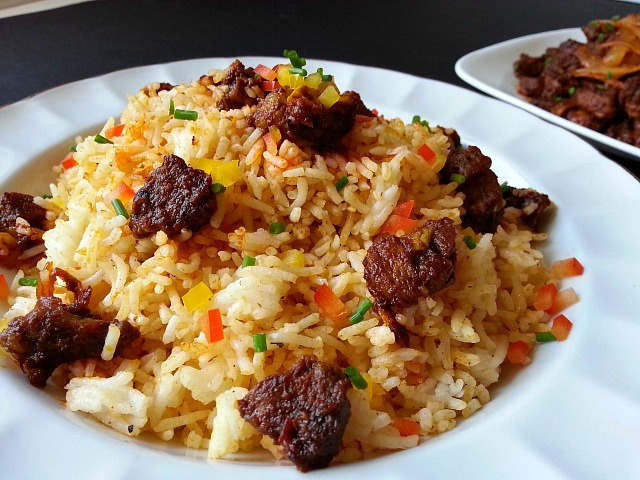 Coming back to the MAGIC, Pulao with sausages/chourico is EXCELLENT. Again Your PRESENTATION of this dish is PHENOMENAL. Your photo shots make the dish ever so PALATABLE. We have finished all Our Chouricos. All I can do now is sit and REMINISCE about all those Goan sausages in the MARGAO,MARKET. In other words Your recipe makes US ALL NOSTALGIC. I am FASCINATED with chourico. VIVA GOA! VIVA CHOURICO! BON APPETIT! Enjoy the rest of the day with whatever You do. This really looks so scrumptious. Yet another recipe of yours that I will be doing. Thanks so much Nandini for great recipes and helping me plan weekly meals 🙂 Have a lovely weekend. I just love the look of this!! You’ve really outdone yourself!!! It sure is a must have for all Goans. Pork is a tricky meat for some people.